Well it’s finally the Christmas season and time for us to put up & decorate our tree. When the children still lived at home we always had a standard 7-8 foot tall Christmas tree, fully decorated from head to toe with fragile glass-ball ornaments of all shapes, colors & sizes. Oftentimes it was a fresh tree cut at a Christmas tree farm. OK it’s only about 3-ft tall but don’t laugh just yet… Although I initially protested, I’ve found I really enjoy the smaller size of the tree. I have several simple yet sentimental decorations for it. I’ve learned you don’t have to decorate a huge tree to make a big impact. And I love that the ornaments on this tiny tree are meaningful to me, unlike the fragile glass-ball decorations of Christmases past. 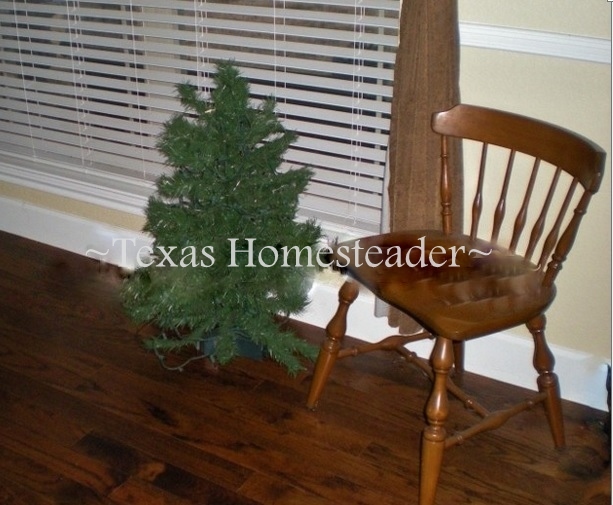 First of all the tree’s small size needs a little boost to bring it off the floor. So we bring out a small wooden folding table when it’s time to set it up. Setting it on that table brings the tree higher off the ground. It also helps disguise the fact that it’s so tiny. To hide the folding table I wrap a deep blue tablecloth with snowflake designs around it & clasp the cloth in the back to hold it in place. Now it’s time to decorate our tree. I have several things that I enjoy using for decorations. I always include a baby spoon used by our children when they were infants. A thin satin red ribbon hangs it on the tree each year. What a wonderful, sentimental symbol of wonderful Christmases of the past and the blessings we’ve received. It’s been on our tree every year since they were toddlers. I also have a very small number of gift ornaments from the kids’ past such as “Baby’s First Christmas” from Hallmark and the like. But none of our decorations are fragile. I also like to use Texas-themed cookie cutters made of both metal and plastic. They are hung on the tree with a short length of twine. I’ve been known to take them off the tree, wash them, use them to make cookies & then rehang them on the tree – Now THAT’S a dual-purpose ornament! And finally is my most fun decoration where I hang candy all over the tree – I call it “EDIBLE ORNAMENTS”. 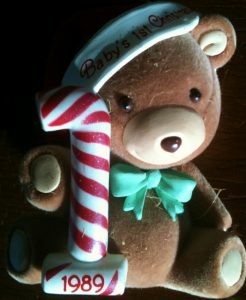 Sometimes I use bent paperclips to attach tootsie rolls or sweet tarts, but I always have festive candy canes as well. The grandbabies know that they are welcome to enjoy them each time they come to visit. When Christmas is over I crush any leftover candy canes and use them for a sweet minty flavor in cookies or stirred into a cup of hot tea. And of course topping the tree is the very same angel that topped our tree when I was a child. 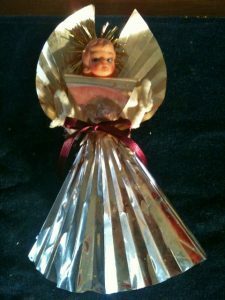 This angel was already VERY used when it was given to us. Sweet neighbors that were updating their own decorations gave it to our family when my parents were very young and starting out. It topped the tree every Christmas for many years. When mom & dad decided it was time to retire this old tattered second-hand ornament I begged for it. It’s adorned my tree every year since. Aaaaahhhh… sweet childhood memories. Although I’m not near organized enough to have my shopping complete & all my packages wrapped & under the tree, you can see that even with what I do have completed so far the gifts actually help decorate the tree itself. And the gifts are all wrapped in a way that prevents mountains of trash from heading to the landfill on Christmas morning. You see, I’m using colorful cloth such as bandanas and reusable cloth bags to wrap our gifts. (you can read that post here) I’m even making my own denim cloth bags by repurposing RancherMan’s worn jeans. And of course we also present low-waste gift baskets filled with our homemade goodies. All of these methods of wrapping our gifts are environmentally friendly. So our gifts are festively presented and there’s NO TRASH! You know I love that. This method keeps to a bare minimum the number of decorations that must be packed up and hauled into the attic at the end of each year. Now you know RancherMan is all over that! What about you – do you have sentimental decorations that you are sure to use each year? 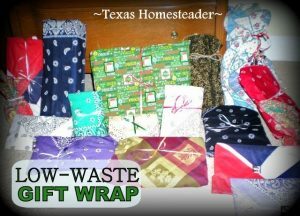 This entry was posted in Blog Posts and tagged Christmas, Environment, Frugality, Holidays, Winter on December 10, 2013 by Texas Homesteader. I’ve had a small tree for years. In fact one year I was heading to my parent’s for the holidays and my married sister was headed for Disney World with her kids. At the last minute the kids started worrying about needing a tree in order to have Christmas so my little tree got tucked into a suitcase, decorations and all, and went to Disney World. You’ve given me a wonderful idea!! This year we have our daughter, son-in-law and nine month old granddaughter living with us. They have their own living room space downstairs where they bought a full sized live tree and decorated it. They will spend their evenings downstairs as a family to enjoy the tree with their sweet baby. However, Lexi spends most of her time upstairs and in our living room and we are trying to figure out the best type of tree to put up since she is crawling, standing and getting into everything! lol. I had toyed with the idea of getting a table top tree, but the jury is still out on that. But! I LOVED your idea of having a small tree that only held sentimental ornaments. Wow! What a special idea that is! 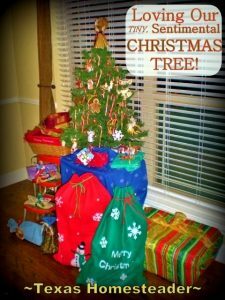 I’m not sure if it will happen this year, but eventually I may just have a “sentimental small tree” for our Christmases. Thanks for sharing! I just love your little tree it is really cute and you have done a great job with it. We don’t have a tree at Christmas, this is something we decided a few years ago, we put up a nativity instead and put our presents around that. This kids have a great time playing with it. I love hearing about peoples traditions and how they do things, we can learn so much from others, without the judging. Blessings to you and thank you for sharing at Good Morning Mondays. When it comes to a Christmas tree, I think that having one that makes you happy is more important than the size. Sometimes the stress that comes from putting out what is expected ruins the spirit of the holiday. I love that you found a way to make your smaller tree work for you and your husband! Enjoy your holiday! We actually bought a smaller 4ft. tree this year, which is in another area of the house and I hope that this will become our new tree when the kids get older. I think your tree looks great. I laughed when I read about you only using the top part of the tree. This year I took our old 9ft tree that was to tall for our new home and made that baby a 5 ft tree. I only used the middle and the top. You would never know my tree was missing a section. Thanks for sharing over at the Snickerdoodle Sunday. I think you have a great idea. Although we haven’t cut our tree yet this year, we are considering a much smaller version. With the addition of my mom’s china cabinet and dining table that I inherited this past year, there is simply not as much room for a large tree as we had last year. I’m really loving the idea, and your post has encouraged me more that smaller is just fine! Thank you for bringing your post and sharing with us at Wake Up Wednesday! I’ll happily sit in the “tiny tree club” with you 😀 I bought a 4′ Christmas tree last year and I can’t imagine going back to the 6′ ones I had in the past. It’s assembled in 5 minutes. It’s decorated in 20. It’s pre-lit, so yay no light strands to untangle. It’s also black instead of green or white, which looks amazing when lit with white lights, and the ornaments really stand out. Plus, being so small, I can do a different theme or color each year without breaking the bank. We are collecting sentimental ornaments! My kids create new ornaments each year. Nice post. After our kids have moved on (which is in just a few years), we’ll either have a small tree and use our favorite few ornaments out of the huge box that we’ve been using for years on a large tree…or, we’ll just decorate one of the spruce trees in the yard with edible ornaments for the birds! Some years we’ve done both. I have so many sentimental ornaments, I’m afraid a small tree couldn’t hold them all. Still I like the idea of a simpler Christmas. Thanks for sharing at TTF! We had a small tree one year and I didn’t mind it at all. You decorated yours perfectly. Thanks for linking up to Thrifty Thursday. We do use the same ornaments year after year, but the last three years we only used clear icicles on a silver aluminum tree. It’s even smaller than yours is. I love having it. The larger tree was such a chore to take down it often drifted into February before I could tackle it. Now everything gets put away the first week of January. I just did the opposite this year and upgraded our Christmas tree to a 6.5 foot. I had a 3.5 foot tree for 10 years and I loved it. So easy to decorate. This year I wanted a bigger one for our new house. Thankfully I bought it during the after Christmas sales and paid very little for it. But I’m going to keep my small tree for when I’m ready to downsize again. What a great little tree! I would love to down size the tree but we are not ready for that quite yet. The kids love making all kids of ornaments so our big tree is very full. I also love your wrapping. I have tried to use fabric for wrapping but I ended up with a very messy looking gift. What a beautiful Christmas story. The part about the angel brought tears to my eyes. I also have so many special ornaments, many of which were made by my children when they were small, as well as the ones made by my grandchildren. Every Christmas at least one of my children brings me a new ornament. Now I have a very large family so, needless to say, I need a large tree to hold all my Christmas memories. It takes a full day to decorate, but I put on the Christmas carols and spend the day enjoying this holy season and its many blessings. I think Rancher Man has the right idea about the size of trees. We have three cats and so long ago decided that decorated or undecorated trees just weren’t for us. Does save dragging out all those ornaments and rearranging the furniture to accommodate it. We have enough decorations on the mantle, front door, kitchen sitting room, garage, etc. to make things look festive. Of course I haven’t done any of that decorating as yet. I usually do it today since it’s my birthday and is close enough to Christmas to keep us from getting tired of all the decorations by the time to take them down comes along.